Several years ago I became interested in mathematical knot theory, so I got a book called The Knot Book by Adams. I also got the Ashley Book of Knots by Clifford Ashley, which is a 600-page encyclopedia of actual knots in ropes/string/etc. I’d forgotten about both books until last night, when a key plastic piece on our bedroom blinds broke: the part that joins the lower single cord to the upper multiple cords that actually go to the blinds. I whipped out the Ashley Book and found the perfect bend, #1463, which is good for joining two cords that have different thickness. I’ve shown my results below, but note that the actual knot is in the upper left and the rest of it is just my quick work to make sure that the thicker piece stays bent and doesn’t straighten out and try to pull through. I don’t think Ashley would approve of that part. The Ashley Book costs about $50 at Amazon, but it really is a delightful book. First, it shows 4,000 some knots, with some discussion of what knots are useful under what conditions. For example, the square knot (aka reef knot) is something that most of us learned as kids. Turns out that it’s a great knot for binding something, but one of its strengths is that you can yank on one of the loose ends and quickly loosen it — I didn’t know that — which renders it totally unsuitable in the situation I encountered: in bending two cords together. 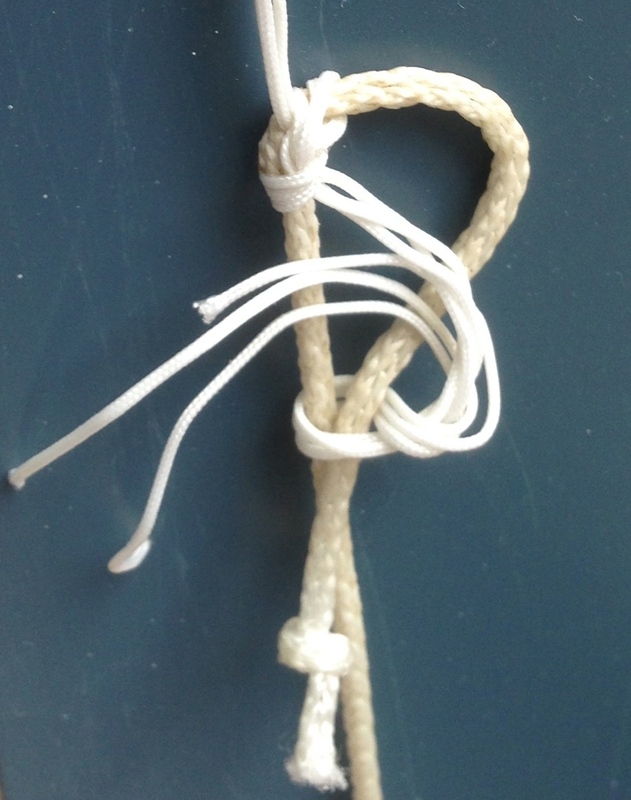 Us city-slickers don’t deal much with knots, but it turns out that this could be a life-threatening mistake if you thought a square knot was secure enough, say, to use for climbing out a window. The Ashley Book’s negatives? It isn’t really a casual book, and is organized logically for a knot aficionado but a little confusingly for us landlubbers. Also, since it was published in 1944, it doesn’t include knots that might be more appropriate for modern synthetic ropes. It’s also a bit expensive for casual use, but I think the positives may well outweigh the negatives for many readers. The Knot Book (the mathematical one) is okay, but ultimately lost my interest. The Ashley book is a fun read, which is full of a lot of history of commercial sailing. The author published the book in 1944, when he was 60, and as a youth he had actually gone to sea on an old-school whaling ship. He obviously talks a lot about knots used to secure things when sailing, but knots cover a lot of ground, including the balls and other shapes that keep the end of a rope from fraying or provide handholds, and ornamental knots. Turns out that illiterate sailors at sea needed to do something to keep from going crazy and there was lots of rope, so fancy knots made a lot of sense. Hard to imagine a tough sailor doing macrame, but there you have it. For the real geek, it’s also fascinating to read the glossary and to see where phrases come from. For example, “the bitter end” is a rope/sailing term, as is “overhaul”, “carried away”, and a variety of other phrases. A phrase that was particularly illuminated by the book was “learning the ropes”. I’d always thought it meant learning which ropes to pull on, or learning how to climb in the rigging, but that’s only part of it. At a more basic level, tying the wrong knot or even tying the right knot but failing to dress it properly would result in the knot failing and someone dying or even the ship being lost. At an even more fundamental level, there were approximately 60 different kinds of rope used on sailing ships (probably only about 20 on any particular ship), so you literally had to know what kind of rope to use for what kind of task, as well as how to stow ropes properly, how to fix the ends so they wouldn’t fray, how to break them in and care for them, how to provide protection from friction, and how to know when they were likely to fail. It’s funny how us users of R, Hadoop, and AWS are tempted to think we’re so so much smarter than those people who lived long ago. But think of the engineering sophistication of sixty different kinds of ropes for different purposes, along with dozens of different knots, and we haven’t even gotten to sails and their materials. Sort of like Conestoga Wagons, which used many different kinds of wood, each better suited for a particular part of the wagon. They were very smart people, they just didn’t have the materials that we have today. Oh, it turns out that “Avast”, as in the pirate phrase “Avast ye landlubbers!” simply means to stop.